Cabinet Finishes: Painted, Stained, Naked, or Distressed? 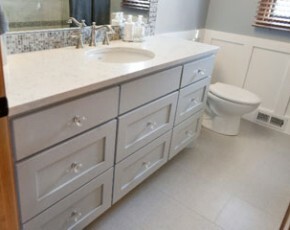 There are three basic finishes – painted, stained, or unfinished. Depending on the type of construction material you’ve chosen, the finishing option may be decided for you. If your builder has used MDF with no veneers, for example, your only option is to paint, because it won’t stain and is ugly when unfinished. Solid plywood, on the other hand, can be painted, stained, or left unfinished. 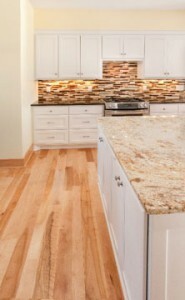 Even so, most people choose a stain to enhance the grain, especially with cherry or hickory. There is a compromise finish available, which is a base coat of paint topped with a glaze. This is used for a variety of reasons: to hide imperfections in the wood, minimize the appearance of nicks and scratches, or to make it easier to clean off fingerprints. Another thing to consider is the size of the room and the color of the walls and floor. A large run of dark cabinets will make a room seem smaller and darker, whereas bright white cabinets will make the same space seem bigger and brighter. 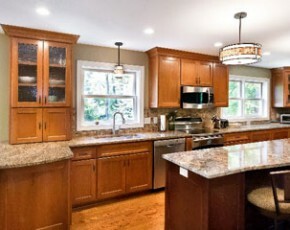 Darker cabinets also appear heavier and more solidly built. We mentioned “Distressed” in the title. A distressed cabinet would still be stained or painted like any other, but in this case, the distressing process would happen prior to that. When a cabinet is distressed, the manufacturer deliberately damages it using chains, rocks, bricks, etc. This puts small, random gouges and scratches all over the cabinet to give it an “heirloom” look, and it is a very popular finish for Rustic designs. Whatever finishing method you choose, know this: the human eye can distinguish almost ten million different colors. Even if we can’t name them all, we can still notice the slightest variations, so it is extremely important to have all of the finishing work done out of the same batch of paint or stain. Artisan Cabinet Company in Chaska, Minnesota, mixes there finishes directly on site to guarantee color consistency for his customers. After ordering your finish, get the details of the mix from your cabinet builder so you can touch-up small damage in the future. If a lot of time has gone by, though, it may be necessary to do a new color match. The amount and quality of light hitting the wood will change the color, and some woods, such as cherry and walnut, will darken and lighten (respectively) over the years. Specialty Cabinets. Not Just for the Kitchen Anymore.